Science, 2018, 11(525), doi: 10.1126/scisignal.aao3428. SB203580 purchased from Selleck. Treatment of CD34+ cord blood cells with SB203580 for 24 hours increased GATA1 protein expression in the cells. Blood, 2014, 124(25):3791-8. SB203580 purchased from Selleck. A, effects of p38 inhibitor SB203580 (1, 5, and 10 μM) on SRP72 protein expression was evaluated by WB using antibodies against human SRP72,SRP54, and GAPDH. A decreased intensity of SRP72 bands was noted when using the inhibitor at 5 μM concentration at 240 min (lane 6) and 10 μM at 120 and 240 min (lanes 8 and 9). B, results were analyzed and RUA illustrated, finding significant results at 5 μM, 240 versus 0 min, and 10 μM, 240 versus 0 and 120 versus 0 min, respectively, (p<0.05). J Biol Chem 2010 285, 32824-32833. SB203580 purchased from Selleck. A, effect of p38 MAPK inhibitor SB203580 (1, 5, and 10 μM) on SRP72 phosphorylation was evaluated. Jurkat cells were stimulated with rhIL-1, harvested at 0, 120, and 240 min, lysed, and immunoprecipitated using anti-human SRP19 andWBusing anti-phosphoserine antibodies. A decreased intensity of SRP72 band was found when using the inhibitor at concentration of 1μM at 240 min and 5 and 10 μM at 120 and 240 min. B, results were analyzed and RUA illustrated, finding significant results at 1 μM 240 versus 120, 5, and 10 μM at 120 versus 0 and 240 versus 0 min *, p<0.05. J Biol Chem 2010 285, 32824–32833. SB203580 purchased from Selleck. We used real time RT-PCR to investigate the effects of SB203580 on SRP72 mRNA expression. All the samples were treated under the same experimental conditions used in protein tests done by WB, and phosphorylation was measured indirectly by IP-WB. The results did not show significant changes on the mRNA expression of SRP72 after the treatment with these inhibitors. Strain-induced BMMSC migration was mediated by p38 activity in vitro. The mechanical strain (static, 6%) significantly promoted BMMSC migration, and this effect was abolished by inhibition of p38 phosphorylation. Arch Oral Biol, 2017, 76:55-60. SB203580 purchased from Selleck. 4 μg of sheep anti-PKBα is immobilized on 25 μL of protein G-Sepharose overnight (or 1.5 hours) and washed in Buffer A (50 mm Tris, pH 7.5, 1 mm EDTA, 1 mm EGTA, 0.5 mm Na3VO4, 0.1% β-mercaptoethanol, 1% Triton X-100, 50 mm sodium fluoride, 5 mm sodium pyrophosphate, 0.1 mm phenylmethylsulfonyl fluoride, 1 μg/mL aprotinin, pepstatin, leupeptin, and 1 μm microcystin). The immobilized anti-PKB is then incubated with 0.5 ml of lysate (from 5 × 106 cells) for 1.5 hours and washed three times in 0.5 mL of Buffer A supplemented with 0.5 m NaCl, two times in 0.5 mL of Buffer B (50 mm Tris-HCl, pH 7.5, 0.03% (w/v) Brij-35, 0.1 mm EGTA, and 0.1% β-mercaptoethanol), and twice with 100 μl of assay dilution buffer; 5× assay dilution buffer is 100 mm MOPS, pH 7.2, 125 mm β-glycerophosphate, 25 mm EGTA, 5 mm sodium orthovanadate, 5 mm DTT. 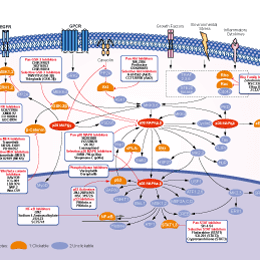 To the PKB enzyme immune complex is added 10 μL of assay dilution buffer, 40 μm protein kinase A inhibitor peptide, 100 μm PKB-specific substrate peptide, and 10 μCi of [γ-32P]ATP, all made up in assay dilution buffer. The reaction is incubated for 20 minutes at room temperature with shaking, then samples are pulse spun, and 40 μL of reaction volume are removed into another tube to which is added 20 μL of 40% trichloroacetic acid to stop the reaction. This is mixed and incubated for 5 minutes at room temperature, and 40 μL is transferred onto P81 phosphocellulose paper and allowed to bind for 30 seconds. The P81 piece is washed three times in 0.75% phosphoric acid then in acetone at room temperature. γ-32P incorporation is then measured by scintillation counting. CT6 cell and BA/F3 F7 cell are rested by washing three times in RPMI and culturing overnight in RPMI, 5% fetal calf serum in the absence of growth factor, antibiotics, or β-mercaptoethanol supplements. 2–5 × 106 rested CT6 cells are resuspended in 2 mL of RPMI, 5% fetal calf serum and preincubated with SB203580 or vehicle control as indicated in figure legends. Cells are then stimulated with 20 ng/ml recombinant human IL-2 for 5 minutes at 37 °C and pelleted in a minifuge for 30 seconds, medium is aspirated, and the pellet is lysed in the appropriate buffer. BA/F3 cells stably expressing deletion mutants of IL-2 receptor β chain are maintained in glutamine containing RPMI further supplemented with 5% fetal calf serum and 0.2 μg/mL G418. The cells are then washed extensively, rested overnight, and washed again before activating with IL-2; such cell preparations are >90% T cells. Cellular proliferation assays are performed by measurement of [3H]thymidine incorporation. Ferdinand V. Lali, et al. J Biol Chem, 2000, 275(10), 7395-402. Birkenkamp KU, et al. Br J Pharmacol, 2000, 131(1): 99-107. Barancik M, et al. J Cardiovasc Pharmacol, 2000, 35(3), 474-83. Jin N, et al. Int Immunopharmacol, 2011, 11(9):1319-26. SB202190 (FHPI) : Pan-p38α/β inhibitor, IC50=50 nM/100 nM. Skepinone-L New : p38α-MAPK, IC50=5 nM. PH-797804 : Phase II for Chronic Obstructive Pulmonary Disease (COPD). Skepinone-L New : Selective p38α-MAPK inhibitor with IC50 of 5 nM. Pexmetinib (ARRY-614) is a potent, orally bioavailable, dual p38 MAPK/Tie-2 inhibitor with IC50 of 4 nM/18 nM in a HEK-293 cell line. Phase 1. 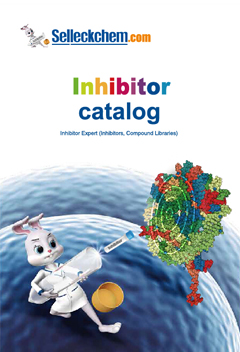 SB239063 is a potent and selective p38 MAPKα/β inhibitor with IC50 of 44 nM, showing no activity against the γ- and δ-kinase isoforms. Doramapimod (BIRB 796) is a pan-p38 MAPK inhibitor with IC50 of 38 nM, 65 nM, 200 nM and 520 nM for p38α/β/γ/δ in cell-free assays, and binds p38α with Kd of 0.1 nM in THP-1 cells, 330-fold greater selectivity versus JNK2, weak inhibition for c-RAF, Fyn and Lck, insignificant inhibition of ERK-1, SYK, IKK2. Features:The first p38 MAPK inhibitor to be tested in a phase III clinical trial. SB202190 (FHPI) is a potent p38 MAPK inhibitor targeting p38α/β with IC50 of 50 nM/100 nM in cell-free assays, sometimes used instead of SB 203580 to investigate potential roles for SAPK2a/p38 in vivo. Ralimetinib (LY2228820) is a novel and potent inhibitor of p38 MAPK with IC50 of 7 nM in a cell-free assay, does not alter p38 MAPK activation. Phase 1/2. Losmapimod (GW856553X) is a selective, potent, and orally active p38 MAPK inhibitor with pKi of 8.1 and 7.6 for p38α and p38β, respectively. Phase 3. PH-797804 is a novel pyridinone inhibitor of p38α with IC50 of 26 nM in a cell-free assay; 4-fold more selective versus p38β and does not inhibit JNK2. Phase 2. VX-702 is a highly selective inhibitor of p38α MAPK, 14-fold higher potency against the p38α versus p38β. Phase 2. Features:Highly selective, orally active inhibitor of p38 MAPK. TAK-715 is a p38 MAPK inhibitor for p38α with IC50 of 7.1 nM, 28-fold more selective for p38α over p38β, no inhibition to p38γ/δ, JNK1, ERK1, IKKβ, MEKK1 or TAK1. Phase 2.